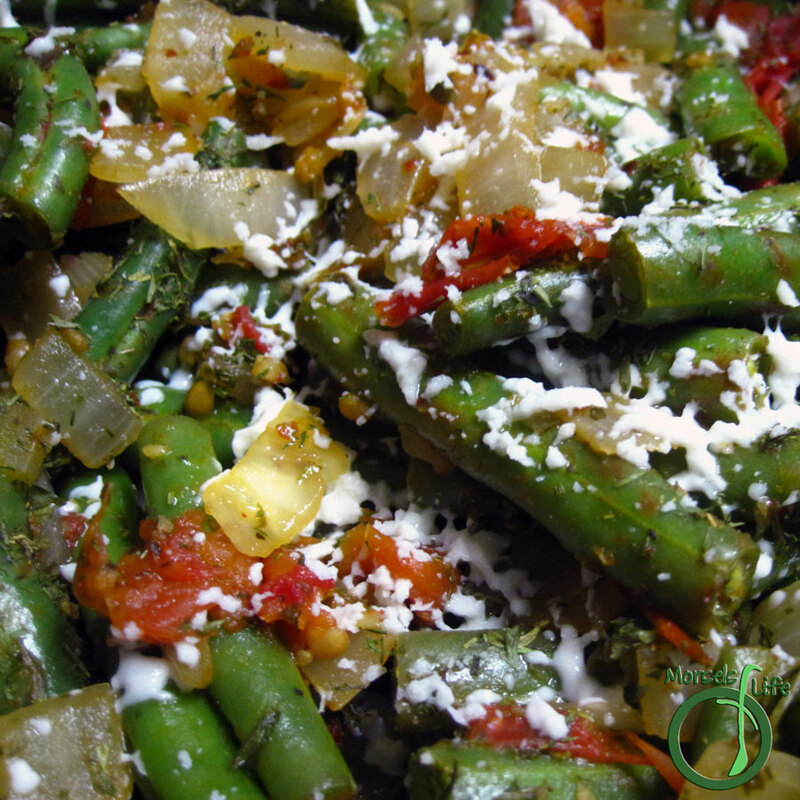 A simple Greek-style green bean dish cooked with tomatoes and onions. I purchased some green beans and needed to use them, so I looked for simple and straightforward recipes and found some Greek-style green beans. I have no idea how authentic of inauthentic these beans are, but I say, "if it's tasty and easy, it works for me!" These beans seemed easy enough - just cook the green beans with tomatoes and onions and then throw in a bunch of herbs. I went for a simplified version - using just green beans, tomatoes, and onion, but you could easily add your own favorite materials. Some typical options include potatoes, zucchini, or cubed meat. Think of my Materials and Methods as a starting point, and see where your creativity leads you! What's your favorite way to make or eat green beans? 1/2 teaspoon red pepper flakes I used gochugaru. seasonings I used parsley, oregano, and dill - about a teaspoon each of oregano and parsley and a tablespoon of dill. cheese, crumbled Feta is a good option. I didn't have any, so I used mozzarella. Cook onions in a small amount of oil until tender, then add garlic and pepper flakes, cooking until fragrant. Cut green beans into bite sized pieces. Add green beans, oregano, and tomatoes to onion mixture. Simmer until beans are tender. Stir in dill and parsley. Garnish with cheese if desired. Yum! I'll have to bookmark this one so I'm ready when the tomatoes and green beans are coming out of the garden by the pailful next summer!